Remove from burner. Stir a small quantity of the hot mixture into the beaten egg yolks, and immediately add egg yolk mixture to the hot mixture in the saucepan. Cook for 2 more minutes, stirring constantly. Remove from heat and add butter and vanilla. Transfer pudding mixture to a medium bowl. Cover with plastic; refrigerate until well chilled, about 1 hour or overnight. Preheat the oven to 425°. Line a sheet pan with parchment paper. In a large saucepan, bring the water, butter, salt and sugar to a boil over medium-high heat. Remove saucepan from heat. Add flour all at once. Stir until all the flour is moistened, about 1 minute. 5.Return to heat and cook, stirring constantly, for another 1 to 2 minutes until dough forms a smooth ball. 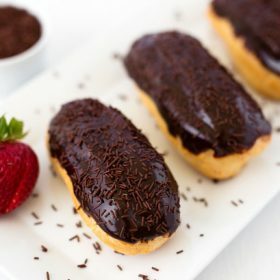 Dip the tops of the eclairs in the warm chocolate glaze (or spread on if that’s easier) and set on a sheet pan. Chill, uncovered, at least 1 hour to set the glaze. Serve chilled.